This dish is another quick way of making kimbap. There is no need for any fillings unlike kimbap. You just need seasoned rice with sesame oil and a pinch of salt rolled or sandwiched in seaweed. This dish is a famous local speciality in Tongyoung, a coastal city in South Korea that previously was called Chungmu, hence the name of this dish. There is a traditional oral story concerning this dish. In the 1940s, a fisherman was so busy catching fish that he often missed his lunch. I guess at that time there were a lot more fish in the sea than now! So one day his wife made him (filled) kimbap that he could easily eat whilst fishing. However by lunch the hot summer weather made the kimbap go bad because of its vegetables ingredients, especially spinach. So the wife thought deeply and came up with an idea of making kimbap without any filling (!). The working fishermen would drink at work and eat pickled squid and radish kimchi together with this dish as Anju. When the steamed rice is hot, mix in sesame oil and salt and optionally sesame seeds. First to save time cutting the seaweed, fold the seaweed over several times, so there are many layers and then cut to fit your mould. I use the smallest size of mould so that the pieces were bite sized. Coat the mould with toasted sesame oil all around and also coat the lid too. Place one of the cut sheets of seaweed at the bottom. Put one spoonful of rice (around 30 g) into the mould on top of the seaweed and press down lightly. Alternatively we can simply roll the rice in half a sheet of seaweed. 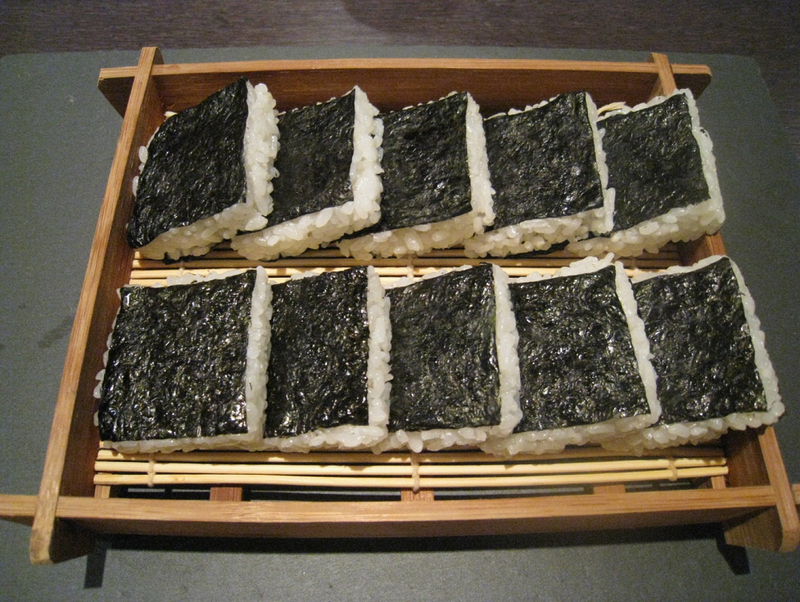 Spread out the rice on the seaweed leaving 2cm at one edge and then roll up from the opposite edge. Finally slice into bite sized pieces. If you do not serve your Chungmu Kimbap immediately then wrapped it individually in cling film.